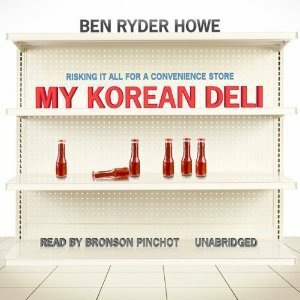 The author and his Korean wife buy a deli for her mother as a grand gesture of gratitude on behalf of the daughter. The mother-in-law, Kay, is a hard-working immigrant who channels her drive and ambitions into the Brooklyn store, ensnaring the whole family to work the deli to make it a going concern. Encroaching gentrification, razor thin profit margins, hard line revenue-seeking municipal authorities looking for store violations, eccentric customers and, Howe’s cultural and physical ineptness at being a store clerk (rather than the Paris Review editor he really is) are some of the many challenges that the family encounters and meets head-on. The story ends rather anti-climatically, but overall the narrative provides interesting insight as to the workings of a convenience store and the thoughts of the author as he sheds the confines of his WASP upbringing. Bronson Pinchot demonstrates his range of character work without drawing attention to himself or making any of the characters seem like caricatures. His impersonation of George Plimpton is remarkable, but not less noteworthy are the voices he uses for Howe as the story’s narrator, the mother-in-law, and the varied ethnic personalities. Three stars for the book and an additional star for Bronson Pinchot’s performance.